Hailing from San Francisco, Waterfield is known for their unique approach to bag & accessory design. Their products are *just* a bit different from what you’d expect. Take the Ranger iPhone X Case, for instance. 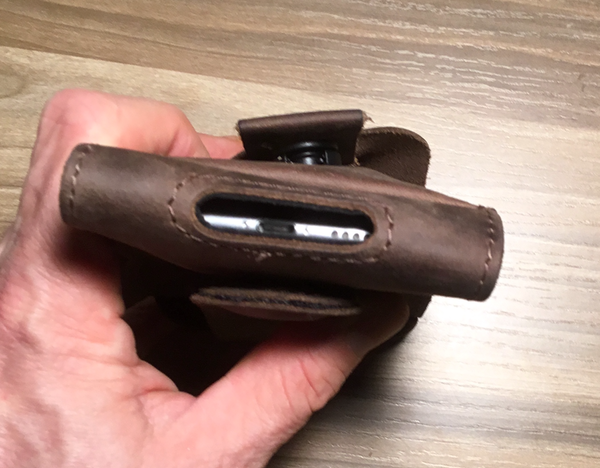 It’s a beautiful full-grain leather case… but there is a lot more going on under that rugged exterior. Let’s go check it out! 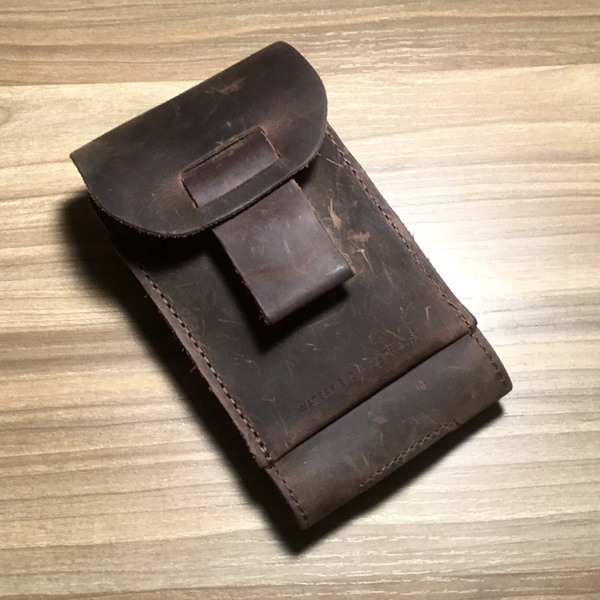 The Waterfield Ranger iPhone X Case is a full-grain leather holster-style case for your iPhone. It’s specifically designed to the iPhone X specifications but will work for an iPhone 6, 7, or 8. An iPhone 7 Plus/8 Plus size is also available. I’m using an iPhone 6s for all the pictures you’ll find in this review. The first thing you’ll notice about the Ranger is the use of a magnetic Fidlock snap closure on the cover flap. The “male” end on the flap automatically snaps into the “female” receptacle on the case when it drops in place and is opened by pulling down on the tab. I love Fidlock hardware. 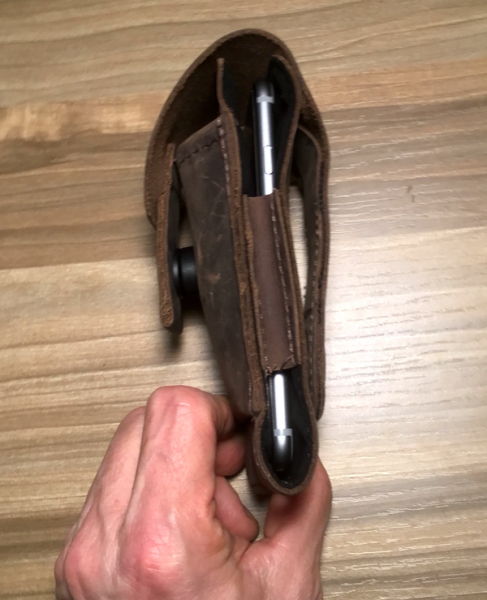 It’s great for one-handed release, but keeps the cover tightly secured when not in use. Once you’ve opened the flap, you’ll find an ultrasuede-lined pocket for your phone. Contoured edges and open sides make it easy to slide your phone in-and-out with one hand, even if you have meaty fingers. 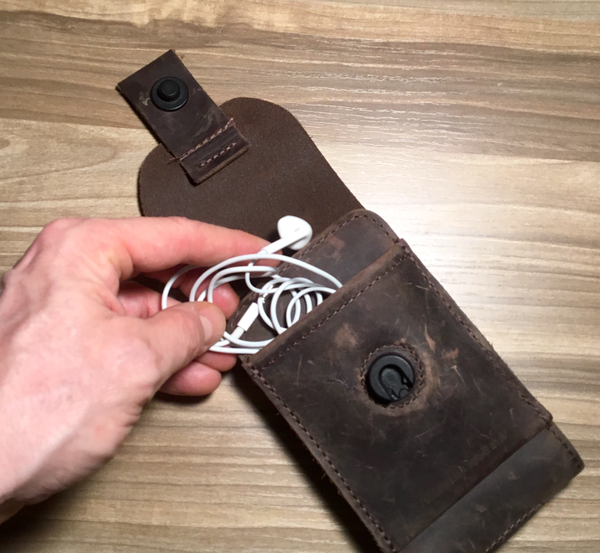 There’s also a second pocket on the front face for small items like cash or your earbuds, but you won’t want to keep any cards in there with magnetic strips (the magnets on the case will scramble them). 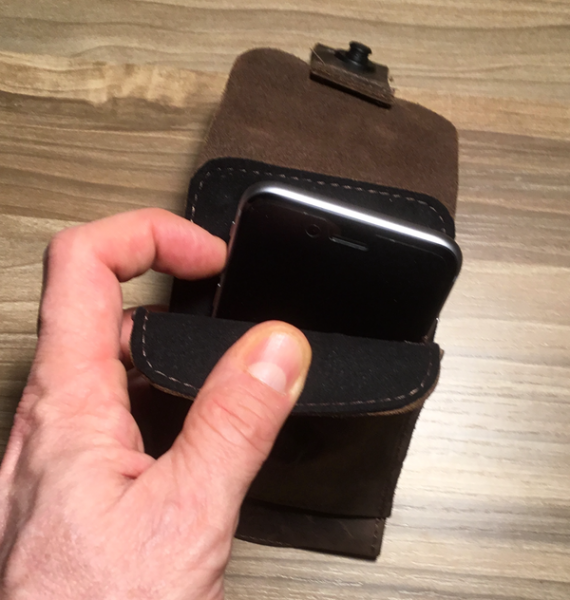 On the rear of the case, you’ll find the attachment clip: a beefy 4” long leather strap that snaps to the rear of the phone case via a pair of quarter-sized magnets (one mounted on the strap, and one mounted on the case). These magnets are seriously strong, powerful enough to clip the case over your pants top, your jeans pocket, or even an open exterior pocket on your bag. I’ve been attaching the case to the exterior pocket of my Saddleback Mountainback gear bag, and it’s still super-secure despite all that heavy waxed canvas. 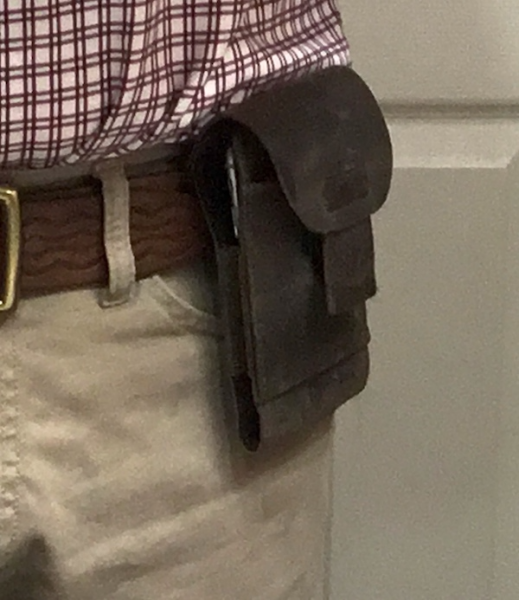 It’s great for providing you options if you forgot your belt! Rounding out the design, there’s a slot cut out on the bottom of the cradle to allow access to your iPhone X cable port. This slot is also wide enough that it doesn’t interfere with the phone’s speakers. The Ranger uses a full-grain distressed leather that’s just beautiful. It’s soft and supple out of the box with luxurious hand feel, and there appears to be no dye bleed after several weeks of use. It smells fantastic out of the box and, as you can see from the photos, is picking up some nice character after several weeks of use. Waterfield also offers the case in either chocolate leather (shown here) or black if that’s your preference. Personally, I think the chocolate leather shows a bit more character. 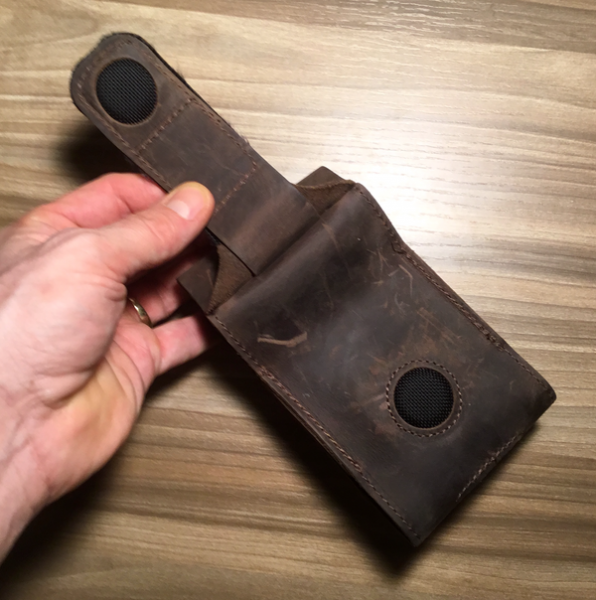 I’ve been waiting to get my hands on a Waterfield product for a review, and I’m impressed. The materials and components are all top notch. Everything is made in San Francisco in small batches, and you can see the quality craftsmanship that goes into the finished product. Simple one-handed access to your phone. Great soft, supple leather quality. Fidlock magnetic closure automatically snaps shut. Extra strong magnet clip ensures that it will stay put — even through thick fabrics. Magnets will scramble magnetic strip cards — keep them in your wallet. 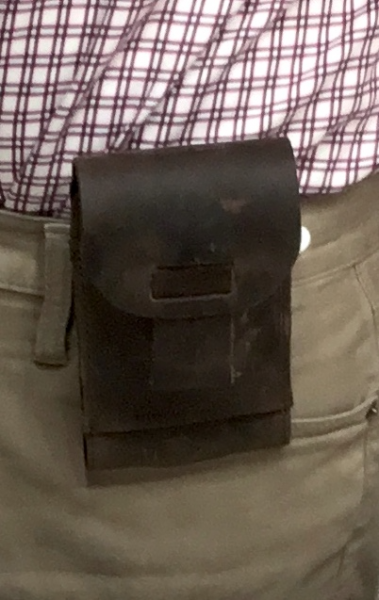 Holster-style phone cases have fallen out of popularity with phones getting leaner & tougher, so your relative happiness with this case will depend on your personal preference. It’s easy to operate with one hand, and the versatile clip design allows for multiple attachment points. 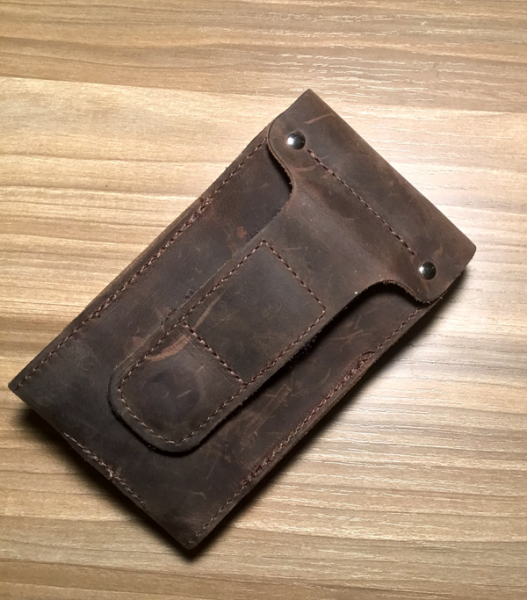 Like all Waterfield designs, the materials and hardware are fantastic. 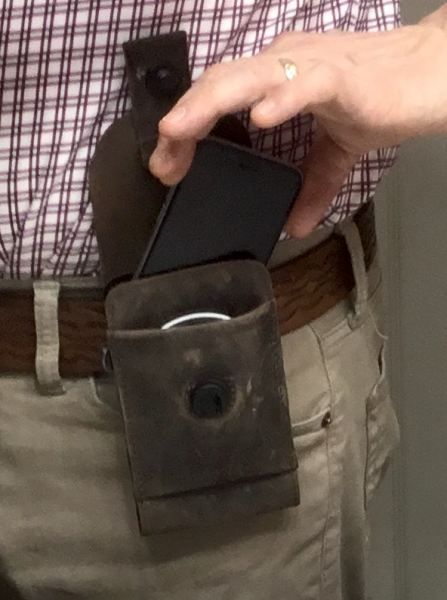 If you like a holster style phone case, the Waterfield Ranger is just about as good as it gets. Source: The sample of this product was provided by Waterfield Design.